Spencer: Back in the summer of 2010 I was obsessed with Bryan Lee O’Malley’s Scott Pilgrim comics, and eagerly awaited the release of their movie adaptation. I spent the weeks leading up to it reading and rereading the comics and preparing myself for the awesomeness I knew the movie would surely be. After I actually saw the movie, though, I was oddly disappointed by the many changes made between it and the comics. It took me quite a while to reconcile the two versions, but once I did, I ended up seeing it twice more in theaters and it quickly became my favorite movie. I had a similar experience reading Detective Comics 28 this week. After last month’s introduction to the “Gothtopia” storyline I was expecting a lot out of this issue—specifically, more exploration of this new Gotham utopia—but the story ended up veering in another direction entirely. I was disappointed at first, but fortunately, the story I got instead ended up being pretty enjoyable in its own right. After breaking free from the brainwashing that made him believe Gotham was a crimeless utopia, Batman finds himself imprisoned in Arkham by the Scarecrow, who plans to finish him off in the morning. Fortunately, Batman is still Batman, and he manages to break out of his cell and free Poison Ivy; together they’re able to discover Crane’s plan—by alleviating people of their everyday anxieties, Scarecrow is able to unleash even grander and purer fears upon them—and concoct an antidote to his toxin. Unfortunately, if they’re going to save the city, they’ll first have to fight their way through Batman’s brainwashed allies! So yeah, half the fun of doing an alternate reality story like “Gothtopia” is exploring the differences between our normal universe and this new universe, and half the point of these kind of stories is usually to explore how those differences effect our protagonist or changes their perception of their life. That’s more along the lines of what I was expecting in this issue, and obviously, it’s not what I got at all. Now, I hate to bring my own expectations into these reviews—I don’t think it’s fair, and I certainly wasn’t expecting writer John Layman to cater his story to my whims—but those expectations shaped the way I viewed this issue so significantly that it seemed essential to bring up. Fortunately, the story Layman did give us is still a lot of fun. I’m impressed by how much sheer content Layman fits into this issue, even with the extra space afforded by having a $3.99 issue with no back-up story. We’ve got backstory, the Scarecrow’s plan explained, Batman’s escape, his freeing of Ivy, their plan to save the city, their fight against Croc, etc. etc. Perhaps it’s just that Layman only has three issues to tell this story, but still, I appreciate the economy of storytelling on display here. Of course, constant stuff happening isn’t always necessarily a good thing, and fortunately, most of the events in this issue are exciting and clever enough to not be a problem. I loved how Batman escaped using the systems he installed back in Batman Annual 2, and I thought Ivy’s role in this issue was not only an interesting use of her long-established abilities, but well set-up by her appearance in part one; even Batman using the calming effects of Scarecrow’s drugs to take down guards without being noticed was impressively inventive. Unfortunately, not everything in this story worked quite as well. As much as I admire its brisk pace, just the sheer amount of victories Batman achieves in this issue makes “Gothtopia” come across like a rather insignificant story. I mean, part one made the transformation of Gotham out to be a big deal—and the story even crossed over into other titles, which screams “big deal”—but now Batman manages to escape from Arkham, discover the motive behind Crane’s attacks and devise a cure all in one issue?! It certainly doesn’t make Scarecrow look particularly dangerous, or even competent for that matter. This is all business as usual for Batman—he doesn’t even really seem to be worried about the effects Gothtopia could have on his allies, such as Catwomanbird—and if Batman isn’t all that interested in this case, why should we be? Moreover, as I said, Crane doesn’t come across as all that competent in this issue. For example, why in the world would he let Batman remain in his costume?! Admittedly, not revealing Batman’s secret identity is hard to work around in these “Batman gets locked up in Arkham” stories, but Layman’s explanation isn’t all that convincing. 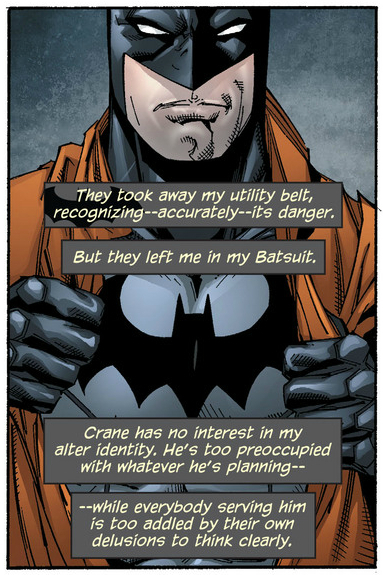 Crane’s too “preoccupied” to take five minutes to remove the costume from his captured archfoe? I understand why Batman needed to keep his costume, but this explanation doesn’t do much to build Scarecrow up as a worthy villain. Furthermore, as much as I like what Layman actually has Batman do here, some of his dialogue comes across as stilted and clunky, like that term “alter identity” or Batman’s oddly juvenile sizing-up of Killer Croc. Ultimately I just keep coming back to my expectations. There’s so much potential in the Gothtopia concept left unexplored. If Gothtopia was a perfect city, how did Bruce become Batman? Are his parents still alive? Now that he’s free from Crane’s spell, does he miss his perfect city or his relationship with Catbird? Does that change or affect the way he’s dealing with the threat? As much as I hate to force my own expectations on an issue—and as much as I legitimately enjoyed much of what Layman actually did with this issue—it feels like there’s a much more interesting story here that we’re just not seeing, and I can’t help but to feel a little let-down by that. Mikyzptlk, ol’ buddy ol’ pal—you prince among 5th Dimensional imps—what’s your take? Did you have any expectations for this issue, and if so, did it meet them? Are you a fan of the direction this story went in? Do you think we’ll see any of these unanswered questions about Gothtopia addressed in the finale? Mikyzptlk: Why, thank you for the lovely introduction Spencer! I also had expectations for this issue, and while Mr. Layman manages to meet some of them, I’m mostly left feeling “meh.” To be honest, I’ve been never been hooked by the premise behind Gothtopia. This was very surprising to me, as I am an absolute sucker for alternate reality stories. I think the problem I’ve had with this “event” is that it was delivered to me with all of the tension of a deflated tire. I mean, the first part of this story practically opens with Batman figuring out the whole ploy! Some (Patrick!) have convinced me that this could have been a great thing for Gothtopia, as it would have allowed the story to exist on its own merits. I think the problem that I’ve been having with this is that I imagined that some of the merits of this would have come from a deeper exploration of Gothtopia itself. That said, there is a bit of that present here. Most notably is the idea that, in Gothtopia, the sane members of Gotham’s society are Arkham inmates, while the inmates themselves are running the asylum. Okay, that’s pretty cute, but one of the few places that Layman manages to explore this Gothtopia reversal in a fun and clever way is so brief that it is almost hard to miss. Check it out. 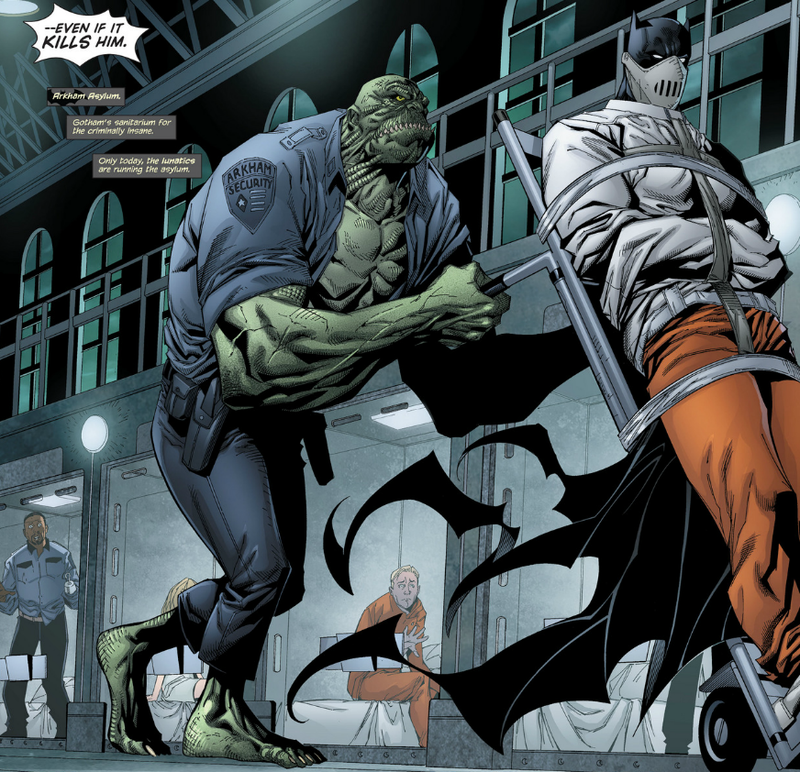 Obviously, that’s Killer Croc “escorting” a captured Batman to his cell. What may not be so obvious is the man standing to the left of the panel. 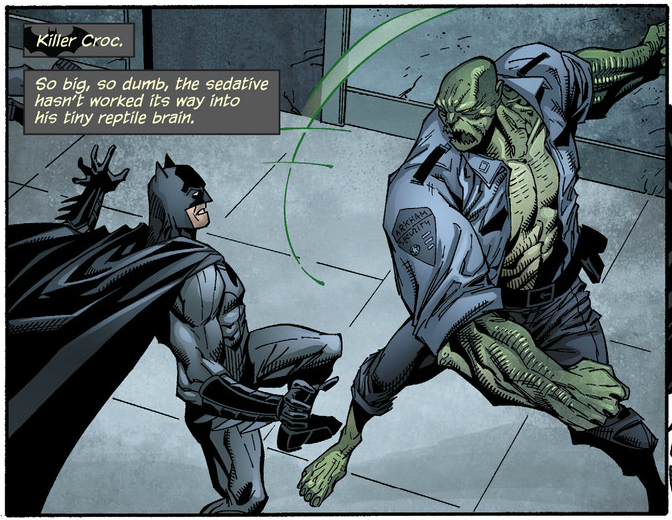 That’s Aaron Cash, one of Arkham’s veteran Corrections Officers, who now uses a prosthetic hook in place of a missing hand that was eaten off by Killer Croc who, in turn, is now wearing the same uniform as Cash. This is definitely a slap in the face to Cash, but it’s also the kind of fun reversal that I wish Layman would have chosen to explore a bit more. Instead, we get to see Batman being the unstoppable force of nature that he is. This could have been cool, I suppose, but I’m left wanting a deeper exploration of who Batman is in the light of Gothtopia. 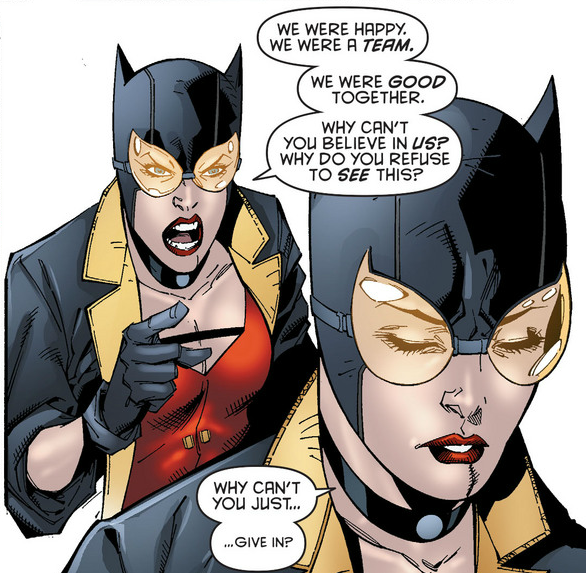 You know, the kind of heartbreaking exploration we got in the incredible Batgirl 27. Now, there might be a bit of that exploration here, but it’s pretty subtle. Take a look a the following panel of Catbirdwoman confronting Batman. Here, we see Selina asking Bruce why he can’t accept Gothtopia at face value. In essence, she’s asking him why he is unable to choose to be happy. I think this might be a break in the wall moment for Selina, even if Batman doesn’t realize it. Batman obviously has to save the day here and put a stop to Gothtopia, and Catwoman knows that. The problem here is, and Selina knows this, is that even without Gothtopia, Batman would refuse to “see” his own path to happiness. He refuses to see that he might actually be happy with Selina, and refuses to see a life outside of being Gotham’s grim defender. While there are a few moments that manage to be kinda neat in this issue, it mostly falls flat in light of Batman’s detached attitude to the whole affair. Spencer has already said it: If Batman doesn’t care, then why should we?